The os cuboideum is a pyramid-shaped bone of the distal tarsus. The cuboid bone is located at the lateral side of the foot in front of the calcaneus and behind the metatarsal bones IV and V. It articulates with four neighboring bones: the calcaneus, the cuneiform bone III and the metatarsal bones IV and V. Occasionally, there is also an articular connection to the navicular bone. 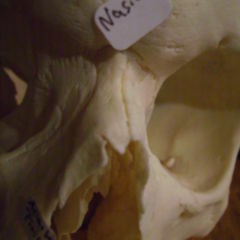 The dorsal surface of the cuboid bone is inclined to the cranial and lateral side. 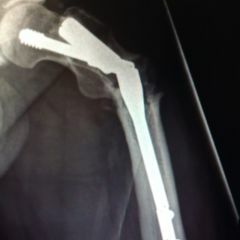 It is rough and serves as insertion for some ligaments. The lower surface of the bone pointing to the plantar side of the foot shows a significant indentation, the peroneal sulcus, which runs in diagonal forward and medial direction. It accommodates the tendon of the peroneus longus muscle, and it is delimited by a distinctive bony ridge, the tuberosity of the cuboid bone insertion of the long plantar ligament to the posterior side. 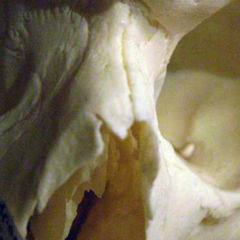 The bony ridge laterally terminates in a small protuberance whose surface exhibits an oval facet. It has direct contact with the sesamoid bone which is embedded in the tendon of the peroneus longus muscle. 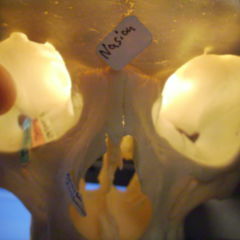 The surface of the bone behind the sulcus is rough. Here, the plantar calcaneocuboid ligament and some tendineous fibers of the tibialis posterior muscle have their insertions. The surface also serves as origin for a few fibers of the flexor hallucis brevis muscle. The posterior surface of the bone is smooth, triangular and curved in a concave-convex manner. 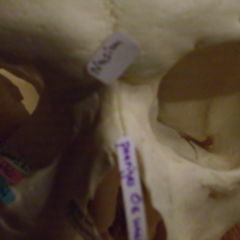 It articulates with the calcaneus. The front surface of the cuboid bone is smaller than the posterior surface, but it has also a triangular shape. It is divided into two articular facets by a ridge. The smaller medial facet is rectangular and articulates with the metatarsal bone IV, the larger lateral surface with the metatarsal bone V.
The lateral side of the cuboid bone pointing to the outer edge of the foot has a slightly concave shape and serves as deflection roller for the tendon of the peroneus longus muscle. On the medial surface pointing to the inner edge of the foot, you can find the articular surface for the neighboring cuneiform bone III. The center of ossification of the cuboid bone usually appears in the 10th fetal month (sign of maturity).